Heat oven to 375°F. Spray 15 x10-inch pan with sides with cooking spray. Mix beef, bread crumbs, salt, garlic powder, ginger and egg until well blended. Shape into 1-inch meatballs; place in pan. Bake uncovered 20 to 25 minutes or until no longer pink in center and juice is clear; drain. In 2-quart saucepan, mix preserves, hoisin sauce, vinegar and red pepper. Cook over medium-low heat, stirring occasionally, until hot. Add drained meatballs and bell pepper. Cook until bell pepper is crisp-tender. Serve with cocktail toothpicks. Cooked meatballs can be frozen up to 2 months. Place drained cooked meatballs in a single layer on a cookie sheet. Freeze uncovered about 1 hour. Move meatballs to an airtight freezer container; keep frozen. Thaw meatballs in the fridge overnight, then heat before adding the sauce. 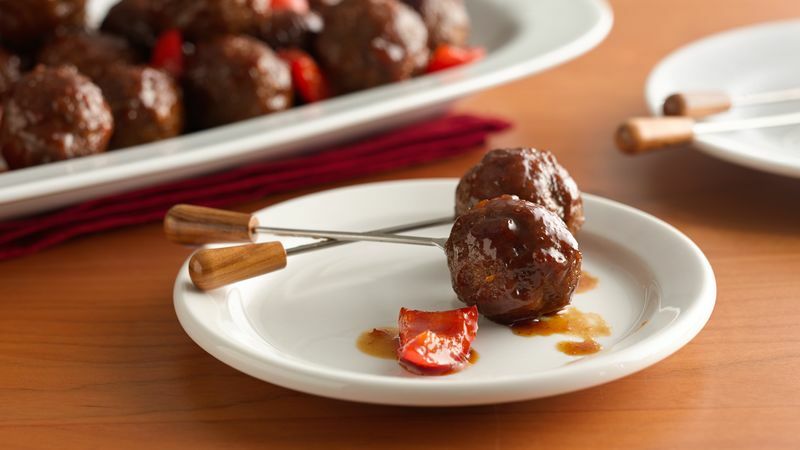 Make the meatballs ahead and keep them warm for parties by serving from a small slow cooker.